How do you restore only your WeChat data from an iTunes backup? What if you don't want to restore anything else and don't want to risk overwriting your data with a backup that you don't need? Is this even possible? Well, you can't really do this with Apple's official tools, unfortunately. iTunes cannot back up and restore specific data types; it can only restore whole backup. Luckily, there is a solution that we will discuss below. You can restore not only your WeChat messages, but also your audio and other attachments. You can restore WeChat data from both your iTunes backups and your iCloud backups. You can make separate backups specifically for your WeChat data. You can extract and export more than 18 different data types from your iTunes or iCloud backups to your computer. For example, you can extract SMS messages from backups. D-Port Pro can restore WeChat data from backups to the new iPhone X and iPhone 8, as well as older models. The following is the steps on how to restore only WeChat data from iTunes backup to your iPhone without affecting the other data on iPhone. Of course, if you would like, you can also restore WeChat data to any iOS device. (1) Install D-Port Pro on your computer and plug your device into your computer with an USB port. (2) Click Restore Backup to Device on the sidebar and you will see a list of backups. Pick the iTunes backup that you want to restore, and then click Next. 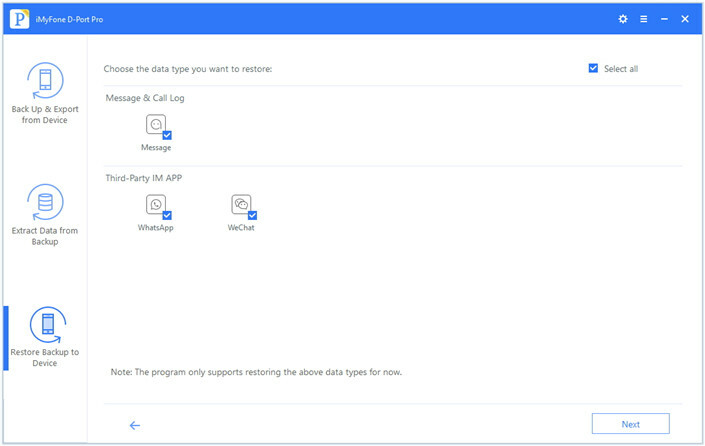 (3) Choose WeChat from the list of apps and then click Next to scan the WeChat data in the backup. You can also check multiple types of data. (4) Preview the specific WeChat data. If you are sure that you want to restore it, click Restore to finish the final step. You can also make a specific backup just for your WeChat data and then transfer this to your new iPhone. For more information, refer to this page on how to transfer WeChat data to new iPhone. It is possible to restore WeChat data only from your iTunes backup. You just need the right tool: iMyFone D-Port Pro. 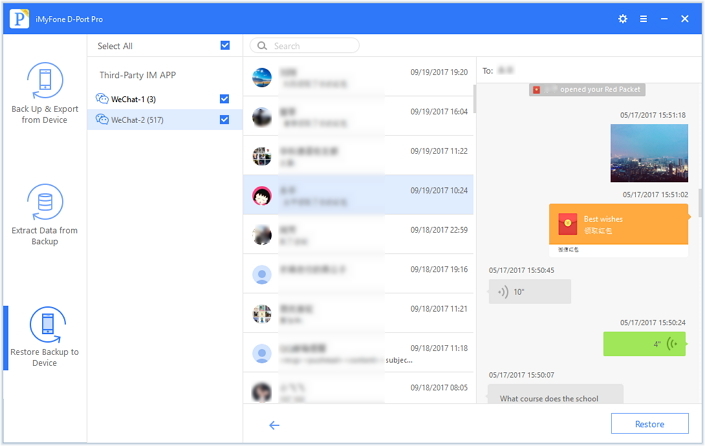 Besides, you can also make separate backup for WeChat data on iOS device, extract WeChat data from backup and save it on your computer... 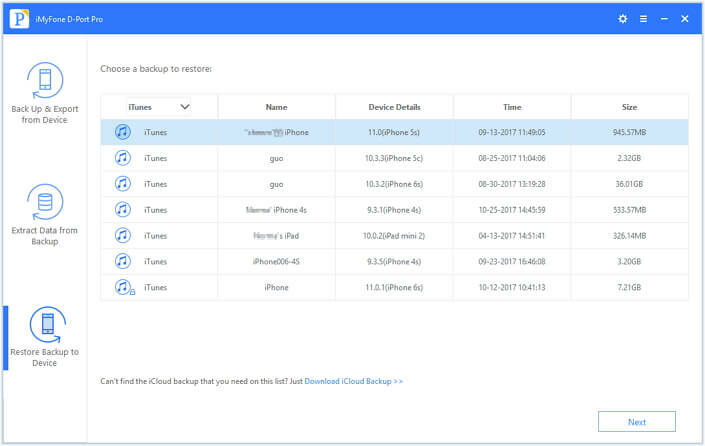 This iPhone backup and restore tool gives you a lot of advantages over Apple's official tools, so give its free trial version a try!